The Spanish superstar headed home an equalizer in the 65th minute, securing a point on the road for New York. Raúl has scored 228 goals for Real Madrid, 28 goals for Schalke and 44 goals for Spain. On Saturday night the legendary striker scored his first regular season goal for the New York Cosmos in a 1-1 road draw with Indy Eleven in a North American Soccer League Spring Season match at Michael A. Carroll Stadium. A sellout crowd of 10,524 was on hand in Indianapolis. Raúl headed in a cross by winger Walter Restrepo from just inside the six-yard box in the 65th minute. The Cosmos rallied from an early 1-0 deficit to claim four points from back-to-back road games to open the Spring Season. It was the fourth consecutive draw between the two sides since Indy joined the NASL in 2014. “Unfortunately tonight we were unable to score that second goal that would give us the three points, but overall it was a very good match from the players,” said Cosmos head coach Giovanni Savarese. Indy Eleven, which played the Atlanta Silverbacks to a 1-1 draw in its opener last week, jumped out to a 1-0 lead against the Cosmos in the 12th minute. Cosmos goalkeeper Jimmy Maurer came off his line to challenge a ball from midfielder Osman Melgares. Maurer raced out of his 18-yard box and tried to head the ball clear, but it fell right to Jamaican international Brian Brown, who chipped in from distance for his first Indy Eleven goal. Maurer made a key stop later in the first half when he dove to his right to parry away a shot by midfielder Dylan Mares from 19 yards out. 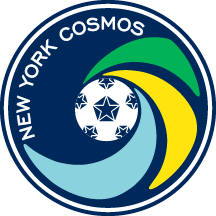 The Cosmos, who beat the Fort Lauderdale Strikers 1-0 last week, dominated possession after halftime and had a series of scoring chances on set pieces. In the 54th minute midfielder Marcos Senna played a diagonal ball off a free kick to Raúl, who quickly chipped into the box. Restrepo ran onto the ball, but put his attempt off the outside netting. In the 64th minute Senna served a teasing ball into the box that forward Mads Stokkelien latched onto, placing a first-time volley on target from the penalty spot. But German goalkeeper Kristian Nicht made the save and the ball caromed out for a Cosmos corner. One minute later, though, Raúl scored his all-important first regular season goal in a Cosmos uniform. It was only his second NASL appearance. 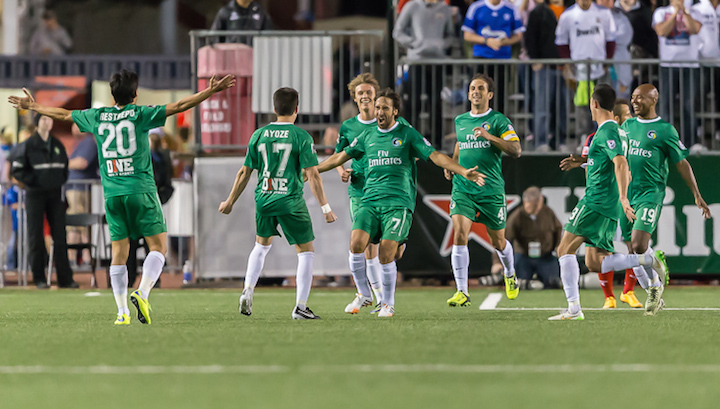 The Cosmos will take on the Tampa Bay Rowdies in their home opener next Saturday at 7 p.m. ET from Shuart Stadium at Hofstra University.